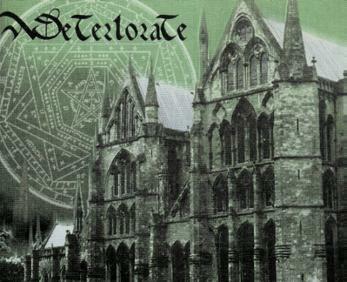 Deteriorate first appeared in the music scene back in 1992 with a self-titled demo. A year later they released their first CD Rotting in Hell through JL America. Some time after, they would go through several line-up changes. After establishing a new line-up, they released their second effort, Gather the Nebbish (1994). Their next release, The Senectuous Entrance, came out in 1995 through Pulverizer Records. This release contained some songs from Gather the Nebbish and revealed a new direction for the band. This marked Deteriorate's transition from their original death metal sound to that of black metal. The following is an interview with guitarist Frank Ierovante. When did the band form and who founded it? We formed in June of 1991, Joe and myself being the only original members left, we are also the founding members. What is your current line-up of members? The permanent line-up is: Gannon (vocals), Joe Gorski (lead guitar), Dark Woods (drums), Frank Jerovante (guitar), Thorous (bass). I understand you will be releasing a new CD this summer. What will it be called? Do you know what label it will be under? Our new CD will be out as of April 16, 1996. The title is "The Senectuous Entrance." We are signed to Pulverizer Records in the U.S.A., and Progress Red for European distribution. The CD is also available from us for $12.00 (CD only). In your opinion, what makes Deteriorate different from the rest? It seems every band thinks that in some way they are different than all the others and that they have something new to contribute...it is wise to say that too much of anything is a bad thing...for every band with talent there are many without, disrupting and ruining the chances the real musician's success. Alas, what do you feel Deteriorate has to offer an already overcrowded scene? Wow! What a question! I am not sure what you are saying...that there are too many bands or that Deteriorate is but an average band. We think that we are very original, the music we write comes from us, we are influenced from each other. We think we are an original band with a dark and brutal feeling to our music that no one else possesses. What do some of the topics of your songs deal with? Our singer, Gannon, writes all the lyrics, dealing with places in the world. Some of the stories are about ancient places and religions. He is very personal with his lyrics and a very serious lyricist. Explain to us your thoughts on Christianity. I really don't have any opinion on it. I don't care what people are into, but I think it's stupid to pressure people into a religion of any type. Do you or any of the other band members possess an interest in the ancient religions and ways of thought? Yes, Gannon and Joe are very much into that sort of thing, they're always studying and reading books of dark and disturbing content. What are your personal assumptions of death? What would you like to have awaiting you after your physical death? I think death is the beginning of life, where we are all judged and sentenced, that's where we will truly know what life and death are all about. After I die I would like to be greeted by many hot chicks that would relieve my after-death tension! What are your views on the world today? Do you see any hope? I hate this place! The world is very fucked up and I don't see any hope. I'm sure people will survive, but life will always be brutal at best. What/who inspires your in life both musically and non-musically? I am inspired musically by bands like Slayer, Unleashed, Entombed, Grave, etc. Feelings of hate, anger, and depression also influence my writing. Are there any closing comments you would like to make? Thanks also to you! If anyone wants any information on the band or merchandise just write. Our new CD is $12.00 from us or Pulverizer Records.